Just as the U.S. was turning its attention back to Europe to face the threat posed by Russian aggression, Kim Jong Un—North Korea’s 33-year-old supreme leader—served up three reminders of why the Asia-Pacific Theater is just as complex and dangerous as the rest of the world. In January, the Democratic People’s Republic of Korea carried out an underground test of what it claimed was a hydrogen bomb. Although some outsiders believe it was more likely a conventional or maybe boosted-fission bomb, this was still the fourth nuclear test conducted by North Korea since 2006. In February, North Korea launched a long-range rocket that put an object into orbit. This was not the first such launch, but it is a sign of continued technological advances. In March, South Korea fired three salvos of missiles into the sea, including one ballistic missile that flew 800 kilometers. As the U.S. and South Korea consider how to respond, they must keep China in mind, a nation in the middle of a long-term military modernization that the Defense Intelligence Agency reports is improving its capabilities to fight a short, intense regional conflict and a nation that opposes introduction of the U.S. Army’s Terminal High-Altitude Area Defense system (THAAD) onto the Korean Peninsula. Army Gen. Curtis M. Scaparrotti, commander of U.N. Command, Combined Forces Command and U.S. Forces Korea, told Congress he favors deploying THAAD as a complement to the additional advanced Patriot missile batteries sent to South Korea after the missile and rocket tests. The THAAD decision remains something for diplomats to handle. The U.S. Army never really took its eye completely off the Indo-Asia-Pacific Theater, not even at the height of combat in Iraq and Afghanistan. After all, America has had 117 years of continuous presence in the Pacific, and 63 campaign streamers to show the level of commitment. But as the direct combat roles in Iraq and Afghanistan were winding down in 2011, DoD and the White House announced what became known as the Pacific Pivot, a rebalancing intended to shift some resources and attention to a region that was a lesser priority for a decade. That move also made China nervous. Five years later, the Asia-Pacific region has some stronger partnerships among the U.S. and other nations, partly the result of several large troop deployments and multinational exercises, and also because of improvements in military capabilities. In a twist of fate that shows why the Army’s operating doctrine is called Winning in a Complex World, the security environment is not demonstrably safer today in the Indo-Asia-Pacific Theater, but the 2017 defense budget contains another shift in attention, this time to Europe. A Feb. 2 White House policy statement says the European Reassurance Initiative is a response to Russian aggression against Ukraine, providing $3.4 billion in fiscal year 2017, a fourfold increase over 2016. “This is a challenging and important time for NATO, a cornerstone of trans-Atlantic security that is increasingly called upon to be a cornerstone of global security,” the document says. Army Chief of Staff Gen. Mark A. Milley told a Senate committee in late February that Asia remains a major concern. “In Asia and the Pacific, there are complex systemic challenges, with a rising China that is increasingly assertive militarily and a very provocative North Korea, both situations creating the conditions for potential conflict,” Milley said. 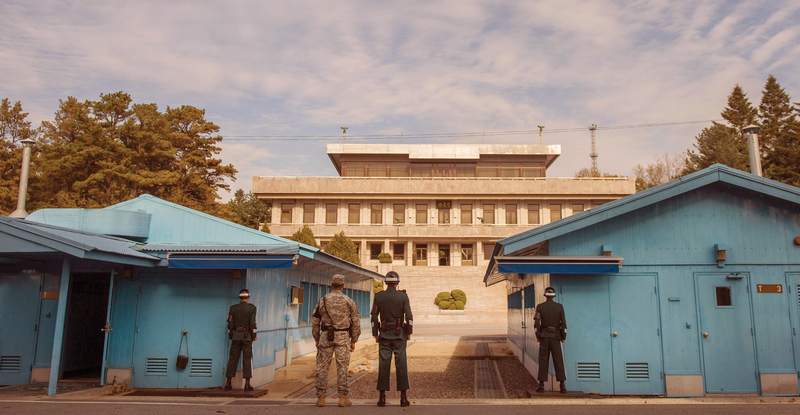 U.S. and Republic of Korea soldiers guard the border at the Demilitarized Zone between North and South Korea. About a third of the deployable, operational Army is committed to the Pacific, Milley said—about 80,000 soldiers in total. Having a force so large “does a lot of things that I know are worthwhile for deterring any potential outbreak of hostilities and then shaping the environment, reassuring our allies,” he said. Overall, U.S. Army Pacific estimates it has 106,000 assigned or aligned Regular Army, Army National Guard and Army Reserve soldiers, making it the largest service component command in the world. In a report last year about gaps in U.S. security, the nonpartisan RAND Corp. said, “The problem with the U.S. defense posture in Asia is not primarily one of inadequate numbers of American forces deployed forward.” The U.S. has about 325,000 service members deployed in the region when Army, Marine Corps, Navy and Air Force units are counted. “In a crisis, this risks creating a situation in which U.S. efforts to strengthen deterrence and stabilize the situation by sending more forces to the region could actually have the opposite effect, provoking China’s leaders into attacking lucrative targets pre-emptively as a means of gaining the initiative in a conflict,” the report says. The RAND report recommends a step already being undertaken to improve air defense, cyberdefense and anti-satellite weapons. Scaparrotti, the U.S. Forces Korea commander, lists developing a robust, tiered ballistic missile defense as one of his critical near-term objectives. Another RAND Corp. paper, “Limiting Regret: Building the Army We Will Need,” says that North Korea poses not just a nuclear threat but also a large conventional threat to the region. Of its 13,000 artillery pieces and multiple rocket launchers, about 8,000 are in protected underground facilities within 100 miles of South Korea. 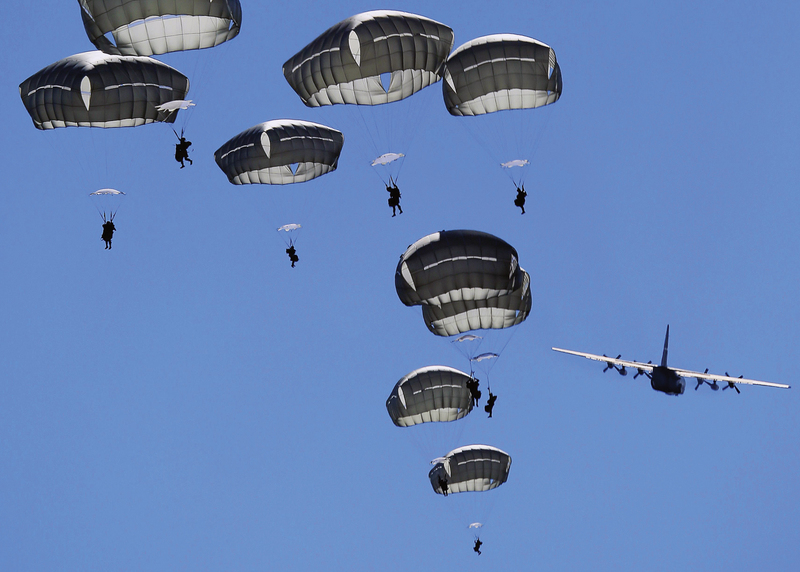 Paratroopers from the 501st Infantry Regiment descend during an exercise with Japan and Australia at Joint Base Elmendorf-Richardson, Alaska. This isn’t a new threat, but it’s one becoming “potentially more dangerous” because the range of North Korea’s weapons is expanding, more South Koreans live near the border, and North Korea appears to be close to building a small nuclear weapon that could be fired from an 8-inch artillery shell. RAND estimates that North Korean use of weapons of mass destruction could result in a U.S. deployment of 188,000 soldiers, similar to Operation Iraqi Freedom. This is a sizable commitment considering the U.S. Army already has more than 100,000 soldiers assigned to the Pacific. If the North Korean government were to collapse, finding and securing weapons of mass destruction would be a top U.S. concern that could “require an additional 150,000 U.S. troops over and above the forces already stationed and presumed to be available in the Asia-Pacific region,” the report says. Navy Adm. Harry B. Harris Jr., the U.S. Pacific Command commander, warned Congress “a number of challenges” have emerged in the Indo-Asia-Pacific region over the past year “that place stability and security at risk,” and he listed North Korea’s aggression, China’s destabilization of the South China Sea, and terrorist attacks in Bangladesh and Indonesia. Russia also is strengthening its Pacific-based military capabilities. In a joint posture statement on the 2017 budget, acting Secretary of the Army Patrick Murphy and Milley said they recognize a look to Europe cannot mean ignoring Asia. Milley has warned that the U.S. needs to tread carefully because provocation by North Korea could spread and involve China. “The Chinese are not an enemy,” Milley told the Association of the U.S. Army in January. While China is investing in military modernization, it has shown the same kind of aggressive activity as Russia has against Ukraine.